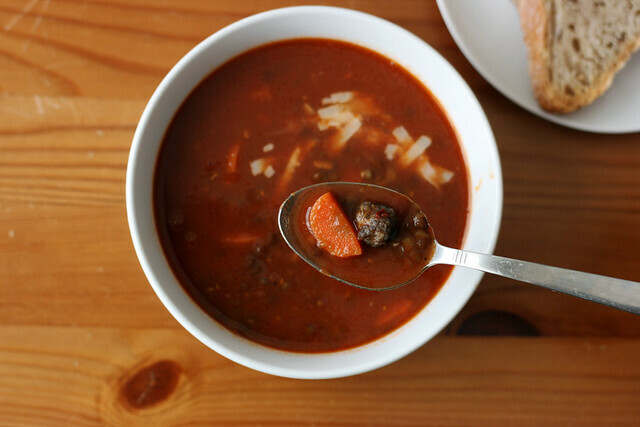 A hearty soup we’ve made over and over again. Heat the olive oil in a large pot on medium heat. 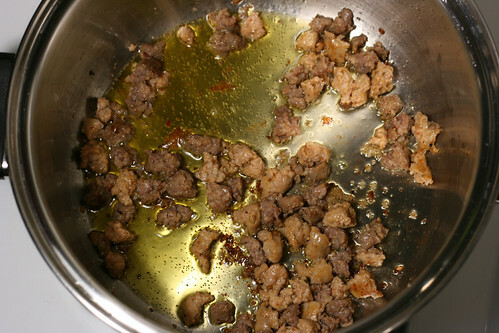 Once hot, add the sausage and break it up into smaller pieces with a wooden spoon until it starts to brown, about 5 minutes. 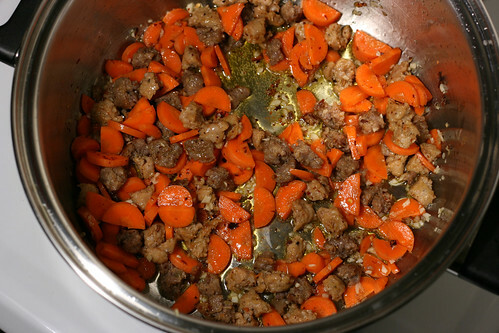 Add the garlic, carrots and red pepper flakes and cook until the vegetables soften slightly, about 5 minutes. 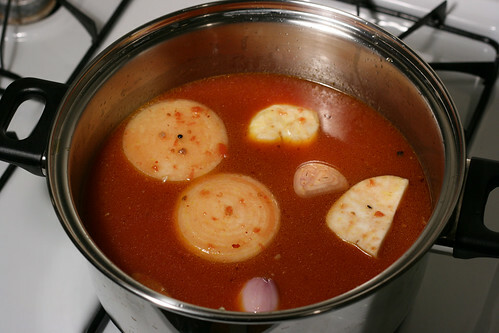 Add the onion, shallot, celery root, lentils, bay leaves, crushed tomatoes, and water. 6 cups of water are approximately two 28-ounces cans so you can use the can to measure out the water and get out any of the remaining pulp. Season with freshly ground pepper to taste. Increase the heat to bring the soup to a boil then decrease the heat to a simmer and cook, uncovered, until the lentils are tender, for a total of about 28 minutes. Discard the celery root, onion, shallot, and bay leaves. 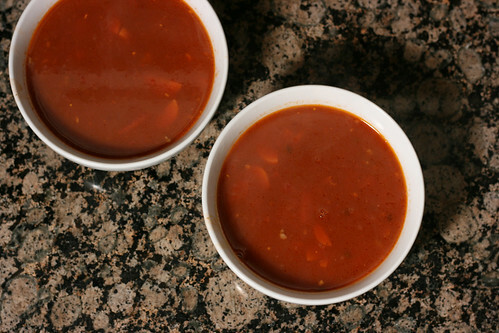 Divide the soup into bowls and top with a small amount of cheese if desired. We served it with two slices of low-sodium bread on the side. 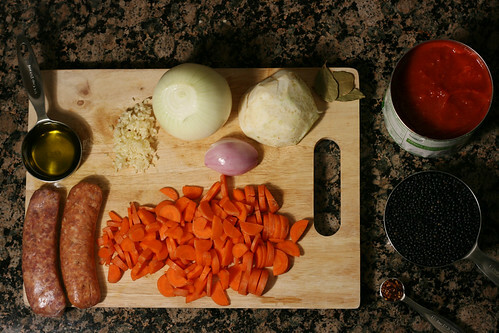 If you like small pieces of onion and/or shallot in the soup, dice them and add them in when you add the garlic, carrots, and crushed red pepper flakes. I prefer using celery root to celery stalks in soups because I don’t use celery stalks for anything other than soups and too much of the giant bunch ends up going to waste. 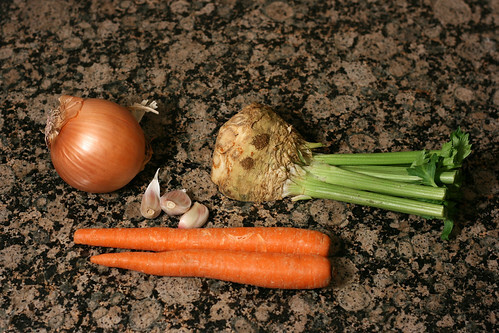 If you can’t find celery root or prefer using celery stalks, you can also slice them or dice them and add them to the soup when you add the garlic, carrots, and crushed red pepper flakes. You could dice and keep the celery root in the soup as well — it is edible — but I wouldn’t recommend trying it unless you already know you’ll like it. If you can’t find black lentils, use brown or green lentils instead. Check the package for the suggested cooking time. Brown lentils might only need about 20 minutes while green lentils might take up to 45 minutes to cook. We’ve made this soup with red lentils as well and it took about the same amount of time to cook (25-27 minutes) but because red lentils are more prone to disintegrating, the soup becomes much thicker. It is still very tasty but if you prefer a thinner soup and can only find red lentils, I recommend adding low-sodium broth to thin it out. (We’ve found that organic low-sodium broths are much lower in sodium content than non-organic low-sodium broths.) 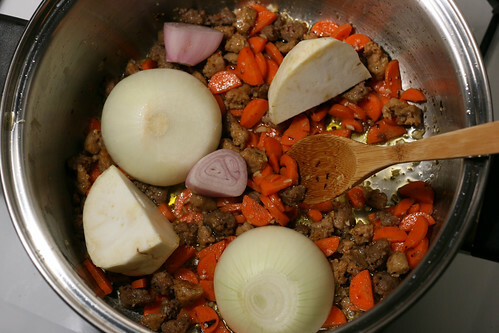 You can also thin the soup out with water but you’ll likely need to add a bit of salt to make up for the taste you lose. this is freakin delicious, totally worth the sodium content.